The junction of the Perimeter Hwy 101 North and Selkirk Avenue (Road 63). 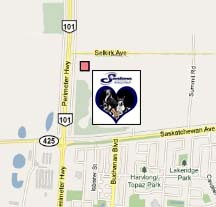 Turn off the Perimeter Hwy 101 North onto Selkirk Avenue and we are the big blue and white brick building you will see as soon as you turn onto Selkirk Avenue. For those times when you can't be there for your companion, please allow us to be that home away from home they'll adore! We are pleased to offer your very special pets the best in comfort and quality. After all, they deserve it, and you should expect nothing less from us! We've been caring for pets for over 47 years now and have recently totally modernized our facility. We invite your inquiries and welcome inspections. Please come out and see for yourself how our pet resort has evolved to fit your changing needs in providing the type of comfort and security you've come to expect from us. At our resort, you will have several choices of spacious, clean and comfortable accommodations for your pet, and of course we even have special spots where your dogs and cats can stay together, just like they would at home, in our theme suites. We are now also able to provide top of the line security with our custom designed security camera and monitoring systems. Our friendly and knowledgeable staff can always monitor all areas of the facility through multiple security cameras that can all be viewed in the office. Those cameras are also linked to our personal residence so we are always able to check in on our guests. We didn't stop there with the use of modern technology, but went a step further to install live web-cameras in various locations throughout our resort. These cameras have made it possible for owners to dial in and watch their pets on a computer anywhere around the world that has Internet access. We can't think of a better way to assure you that your pet is safe and happy than to let you see for yourself! At this time the web-cameras are available in several different areas of the resort, so please ask for further details if you are interested in this feature. please allow us to be that home away from home they'll adore!